The World in Hemispheres. With Other Projections etc. etc. This is a beautiful example of S. A. Mitchell Jr.'s 1866 decorative double hemisphere map of the world. Depicts the world on a hemisphere projection. 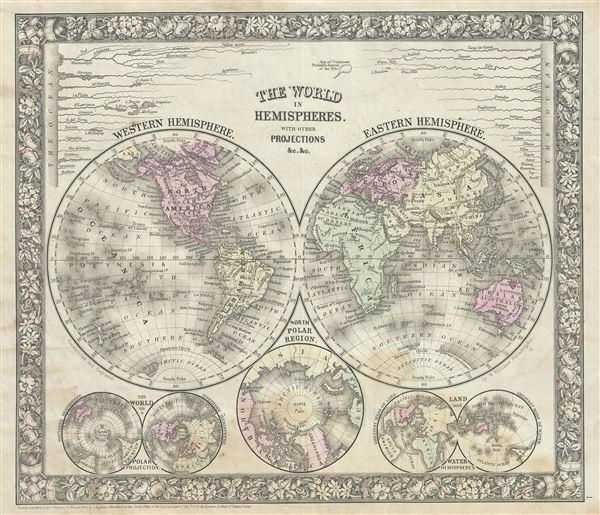 The upper part of the map shows the rivers in relative proximity while the lower half features three additional world maps, a hemisphere map on a polar projection, a land and water hemisphere projection, and one of the northern Polar Regions. Countries are named but boundaries are not defined. The map notes important rivers, cities, islands, mountains and other features and is color coded according to continents with elevation rendered by hachure. Rumsey 2483.001 (1870 Edition). Phillips (Atlases) 831-16. New York Public Library, Map Division 1510790.